It is only natural that we should feel some reticence about assuming this role of Beatrice Fairfax to the ghost fans. But, as our correspondent says, some light should be thrown on the subject at once. Correct social usage in relation to the spirit world is the question of the hour. And although it is rumoured that an encyclopaedia of ghostly etiquette, containing a complete course of instruction in good form, style and deportment, is even now on its way to the printer, we have not heard the date of publication. Unfortunately, we are unable at this time to give this lady authentic views of our greatest living psychic researchers on the subject. An unreasonable prejudice toward the light-headed press seems to prevail in certain quarters. After some weeks of diligent research we are, however, able to quote precedents from the weightiest classics of psychic literature. Always speak to a ghost when it calls. Never permit it to stand willy-nilly on the doorsill for any length of time. This little courtesy is only its due. The oldest traditions of the spirit world demand it. Make your salutation perfectly natural. Otherwise your visitor may feel gauche and ill at ease. Act as if you had an appointment and the ghost had kept it to the minute. Say carelessly and sort of offhand: “Hello, old man! What can I do for you?” Or, if the spectre is a lady: “So sweet of you, dear, to come.” This will start things off pleasantly and open the way for confidences. You will soon find out what the call is all about, anyway. If you begin correctly, the ghost will follow your lead, usually, and make its wishes known. Particularly this is true when it is of the tearful or helpful variety. If the message is of importance, you must conduct yourself accordingly and listen with an absorbed expression. Purely helpful ghosts are often as harmless as the worthy ladies who urge you to wear a camphor ball right through the winter as a preventive for colds, or to make yourself unpopular with your favourite beau by advising him to give up smoking. Treat them with the same gentle forbearance. When convenient, change the subject. By all means retain your mental and physical poise when a ghost is calling. One of the reasons for the meagre data available, on ghost etiquette is the fact that so many persons favoured with apparitions have quite forgotten themselves. They act exactly like the fabled bull in a china shop. Much valuable data has thus been lost to posterity. This is well illustrated by the experience of a successful banker who has a country estate in Jersey. He was visited one day by the spirit of the best cook he ever had. She had left in a huff some months before. Her astral body did not seem to harbour a grudge, however. Doubtless she just wanted to see how things were coming. The banker had been accustomed all his life to meeting only the best people. But on this occasion he quite forgot himself. He rushed first for the door. It was locked. Then for the window. It was locked. The ghost meanwhile developed hysteria and rushed off somewhere herself. When the debris was cleared away next morning it was discovered he had smashed a cloisonné vase, spilled a whole bottle of ink on a real filet scarf and broken a window pane. As his wife pointed out, if he had only observed the most elementary rules of decorum he might have found out how to make the peach cobbler, which was such a favourite of his. Such conduct shows lack of breeding and experience. We cannot urge you too strongly to appear perfectly natural when receiving a ghost. If you are seated remain so. You won’t gain anything by standing up. When reading you may lay aside your book if you wish. Or if you are very nervous you may walk across the room and flick your cigarette ashes off in the tray. This will conceal your embarrassment for the time being. Never turn your back on a ghost while it is in the room. If it calls at midnight, after you have retired, never under any circumstances push an electric switch. Your experience will be valueless if you do. Democracy, it would seem, has not as yet attained a wide vogue from the astral standpoint. Royal shades in some cases must be addressed with as much ceremonial as when they held court on earth. Only a short time ago a young Celtic enthusiast became all worked up over Lytton Strachey’s Queen Victoria. There were some passages about which he disagreed strongly with the writer. He rushed up to a medium who and asked for an audience with the departed ruler. The late Queen appeared, lace cap and all. She answered questions more or less intelligently. As he was leaving the young man started to shake hands. He wished he hadn’t. He felt a rubber glove dipped in slaked lime. Our court etiquette may be a little rusty, but we believe the proper method would have been to touch her fingers tips with his lips. Shaking hands may have seemed a bit ambitious. Lighting effects, we admit, have much to do with the most finished formal introductions to ghosts. This is markedly so at table tipping soirees. Some like it light; others dark. It is all a matter of taste, really. Personally, we have often remarked that the most astounding phenomena occur in the most complete darkness. It may be only our imagination. Then again, there is the question of flowers. Many experts contend that it is best not to speak to a ghost unless you have flowers in your hand. Here, too, one must exercise discretion. It is obvious folly to waste orchids on a spirit which recognizes nothing but dandelions. Proper arrangement of ghosts means much in a social way. Never seat a literary spirit, who is inclined to be a bit set-up about his accomplishments, next to an out-and-out lowbrow, who imagines that the complex is a new-fangled kind of fancy work. It is also suicidal to bring the ghost of a lady who was always braggy about her virtues as a wife and mother into immediate contact with the spirit form of a notorious flirt. Either way you are apt to find yourself marooned in a conversational vacuum as far as the spirit world is concerned. 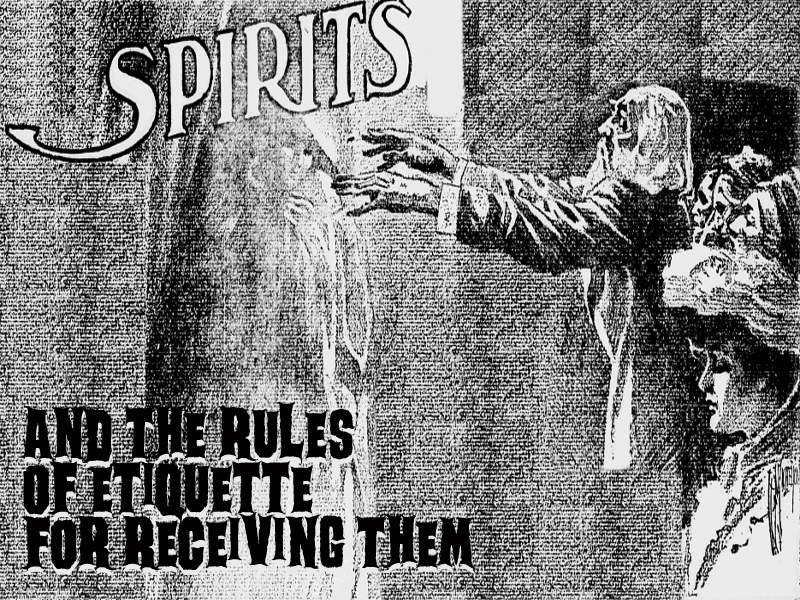 Domestic rules of etiquette for receiving ghosts antedate telekinesis and the toddle. Even in pagan times they were in vogue on occasions when the ghost of a husband or wife dropped in at a former home for a friendly call. Husbands were often obliged to observe various little courtesies before their spirit wives could converse with them on the most trivial and routine family matters. No married man should cherish the fatuous belief that a woman’s interest in clothes ends at the grave. To the ghosts of deceased ladies in ancient times dress was more important. It caused them many an anxious moment, when they were invited to visit the mortal sphere. In fact, there is actual evidence to prove that many a wifely ghost, true to her material self, absolutely refused to answer questions or appear in public because she hadn’t have a “decent stitch to wear.” Can you doubt that it is even so with the gentler shades to-day? Perhaps the lady was unreasonable. But other women know how to sympathize with her. They realize how horribly passé even a ghost must feel in three-quarter sleeves when the really snappy dressers are wearing no sleeves at all. Every established rule for receiving ghosts demands that they be humoured. Housewives in their astral form have often been known to worry over unpaid laundry bills. If you ever meet a ghost with worries like this one, pay the bill for her. It will be to your credit. A woman of Perth, who died in 1838, left a grocery bill of three shillings and ten pence. She kept appearing for days until someone wiped out the indebtedness. Many a student of the psychic is at a loss to know how to act when a ghost has been offended. Such instances have occurred and are really quite embarrassing. We recall the delightfully polished manner of that ghost Imperator. He belonged to the very highest tier of ghostly society. And a gentlemanly shade he was, if ever one returned to earth. No Walter Raleigh had more courtliness or charm. A little group of earnest thinkers and table tippers is seriously considering the question of referring this entire question of the proper method of addressing ghosts to the First International Congress for Psychical Research, which will be held in Copenhagen August 26 to September 2 inclusive. Invitations to attend the meeting have been sent to all of the greatest psychical researchers in the world. Their opinion on this matter would be invaluable. At present the program for discussion at the congress contains the following: (1) The Relation of Soul and Body; (2) The Nature of Telepathy; (3) Mediumnity, Conscious and Unconscious; (4) Origin and Nature of Psychical Phenomena, Levitation, Telekinesis, Dowsing Rod, Materialisation, etc. ; (5) Nature of Hypnotism, Whether of Origin Psychical or Physiological; (6) The Question of the So-Called Human Aura. The committee will also debate the possibility of prohibiting public shows of hypnotism, etc., and the foundation of a permanent international office in Copenhagen for the collection and distribution of results of modern experimental psychical research. Next week we expect to be flooded with telepathic communications about the levity of this article. They will be full of big words such as mendacious” and “flippant.” But what can one do if the scientists refuse to take one seriously? Be that as it may, ten years from now we firmly believe we will be buying: a “best seller” entitled How to Meet a Ghost: What to do, What to Say and How to Say It. You site is very informative and fun. I will send you a free copy of my book The Ghost of Etiquette, if you are interested in reading it.